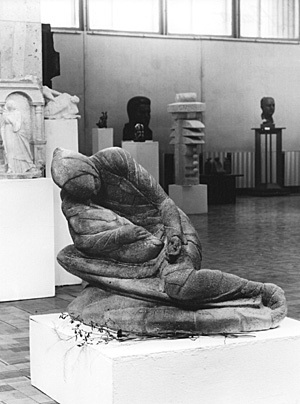 Granite, height 210 cm, 1988. I remember his personal exposition of 1981 both because of some individual works – for his master’s freedom of use of compositional space, and on the whole – for the multiplicity which included even small sketches and which seemed to me superfluous at the time. The beginning and subsequent progress of the artistic path – the artist was then 42 years old – seemed to be quite smooth and happy. That was not so much due to the fact that the sculptor could embody in bronze most of his concepts, as due to the enviable firmness of the artist in the realization of the set tasks, which quality was discernable everywhere – in the great variety of his works’ themes, in their compositional freedom from enslavement, and in the substantial character of the exposition itself. The sculptor emerges genuinely free in those of his works in which there is an unbiased observation of life, a non-violent and inspired plastic interpretation of the multi-faceted and dynamic reality («Dream» (1985), «Boys»(1983). Such is «Pieta» (1990), one of his latest compositions. The artist is not afraid of concrete, and even of some measure of illustrative character of his image, the Biblical essence is perceived through a personification of the Russian woman, an almost typical figure invoking in one’s memory the best works of art on the subject of World War II. But the dynamics of the piece, achieved through master’s favorite constructive lines of diagonal composition, the material – warm and porous chamotte which invites the spectator to close contact, the ‘intermediate’, human-relative dimension, - all this renders to the work a contemporary coloration determining its natural character in any closed or open environment. A wide range of realistic feelings and emotions is also a feature for the composition «Memory» created during the open-air symposium in Yasenki, the work making, in my view, sculptor’s greatest success (1988). 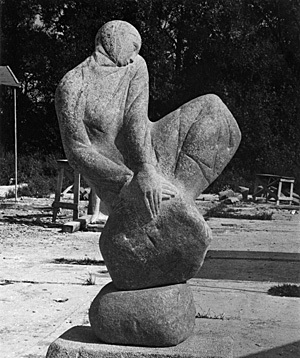 The fine lines of the silhouette of the sitting woman, the natural wholesomeness of the composition, the music of its rhythms, the soft treatment of the stone, and the combination of incompletely cameral and monumentally and significantly persuasive shows emotional and plastic unobtrusiveness making the work organic to any space.